A Civil War Trails stop is located at the red Virginia Farm Market, and we'll see the sign's map a little later. On the left of the picture, the Pughtown Road, now four-laned Rt. 522, heads west toward Little North Mountain. In the center of the picture, the road heads east into Winchester. Before the road plunges downhill, you can see that it cuts through a ridge. West Fort, the Confederate objective, was atop this ridge to the right of the road. Early's march had been masked from Union view by the ridge on the right of the picture, Apple Pie Ridge. Now he deployed his men along this ridge - in the area visible behind the modern Winchester Equipment Company. We'll see the view from there next. From higher up the ridge behind the well stocked Winchester Equipment Company, you can get a better view. Once again, the Virginia Farm Market is the red building on the left. Early's first line deployed in the approximate area of the orchard along the ridge on the right of the picture. At the time of the battle, much of the area was wooded, which forced the rebels to unlimber their artillery at the ends of their line, but would give the infantry cover for much of the advance. The modern Winchester bypass cuts through the foot of West Fort Hill. West Fort was defended by the 110th Ohio, a company of the 116th Ohio, and six guns. Facing them, twenty guns under Lt Col Hilary Jones at either end of the wooded ridge knocked out four of the six Union guns with a crossfire. 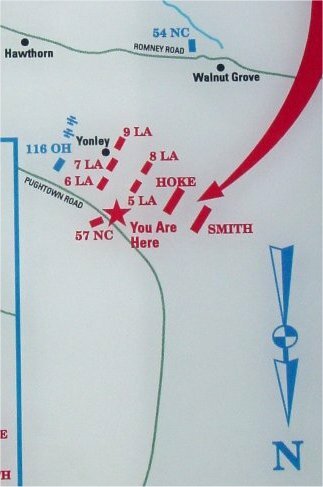 The attack began, with Hay's Louisiana brigade in front, supported by the brigades of Hoke (under Avery), and William "Extra Billy" Smith. The Louisianans reached the bottom of the hill safely, paused briefly, and continued the attack, capturing the fort in hand to hand combat. The Yankees fled to the rear, abandoning their guns. They had lost 50 dead compared to Confederates losses of 66 killed and wounded. Here, from atop Pondview Drive, near the location of West Fort, you can get some idea of why the capture of the position was so important. On the following ridge, shown prominently here, was Main Fort, the primary Union defensive position, and off the picture to the left was Star Fort, separated by a valley. From the east side of town, Edward Johnson's division had already pushed the Yankees back to this ridge. With Early's capture of West Fort, Milroy's force was constricted to the ridge, and at around 950 feet, the captured West Fort hill dominates the Main Fort ridge, at around 887 feet. With his force constricted to such a small area dominated by an enemy position, and with the danger of being cut off, Milroy called a council of war, and it was wisely decided to retreat that night. But it would take luck for the Yankees to escape.